Horizons Beach Resort offers enjoyment and tranquility for your Cape Cod vacation. You may select from newly remodeled efficiency units on the beach, ocean view units at the Terrace Dunes, or multi-room poolside units. All accommodations feature full amenities including kitchens, air conditioning, and flat-screen cable televisions. 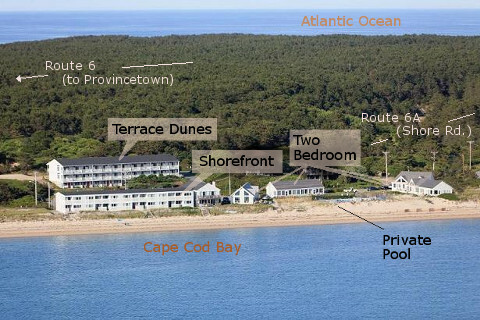 All units have their own sun deck overlooking Cape Cod Bay with spectacular water views. Relax on 500 feet of private beach with a panoramic view of the water and Provincetown. Swim in the bayside outdoor pool and, at day's end, enjoy the ocean breezes and colorful sunsets from the only location along the entire East Coast where the sun can be viewed setting in the West over the Atlantic Ocean. With three quarters of North Truro comprised of conservation land and National Seashore, the town offers tranquility and beauty that cannot be found anywhere else on Cape Cod. Experience this by playing the Highland Links Golf course, touring the dunes, or enjoying endless bike trails. Historic Provincetown, known for its dining, shopping, whale watching, fishing and cultural attractions is just minutes away.